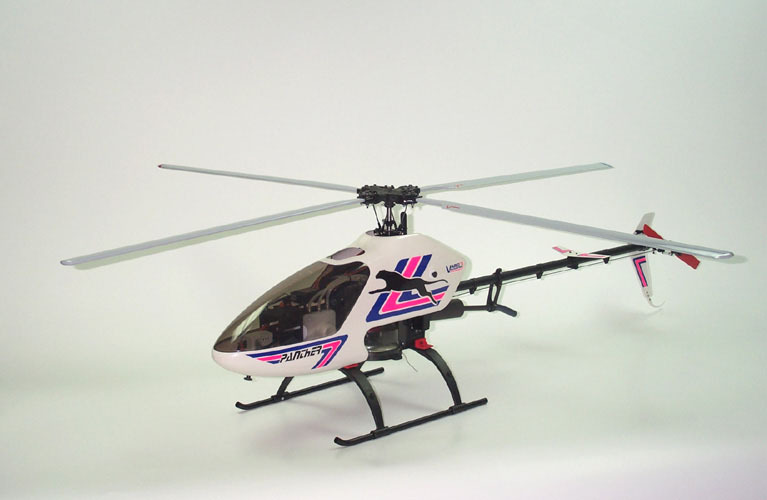 Ever thought of building a multi blade scale helicopter but were afraid of loosing you scale model during the initial test flight. 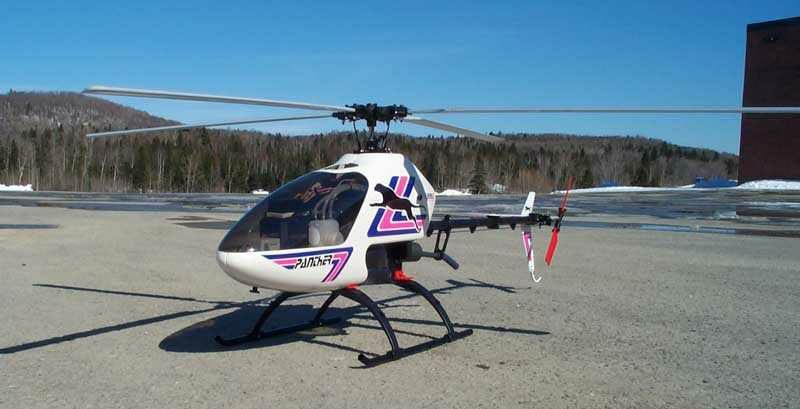 This is Mr. Jean-Yves Barrette's approach to his Bell 412 project. The project started with getting the SkyFox Mechanics set No. 1002/19 for the 412 he was building. The mechanics set was fitted with the 4 bladed Bendix rotor system. To get used to the flight characteristics of the multi bladed system, the mechanics set was converted to a pod and boom by installing: skids, tail boom, canopy, tail fins. Dressed up with a Panther canopy the 4 Bladed trainer is a very cool looking helicopter. Now the helicopter can be set-up, and flight training can begin without the fear or risk of damaging a full scale fuselage. This approach can also be done from using a standard Pod and Boom like the Kobold or any other Vario model. If you are thinking of going to a multi bladed system in a scale fuselage a safe approach is to start with a Pod and Boom and convert it to a multi blade and fly it while you are building the fuselage. Once the fuselage is ready the mechanics and electronics are set up and ready. All that is left is to transfer the mechanics in the fuselage and have fun. Copyright, © 2000, VarioCanada.com. All Rights Reserved.